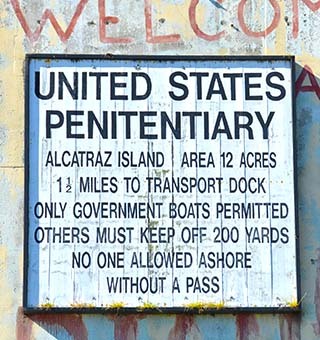 Welcome to Alcatraz, a sign most never wanted to see. 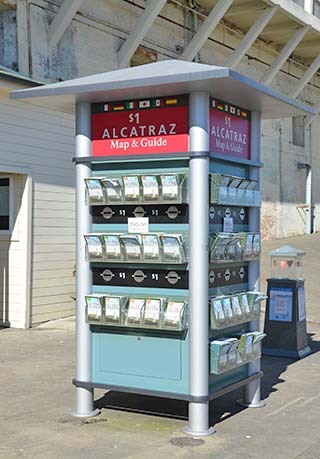 Alcatraz is a large facility and a guide map is quite helpful. 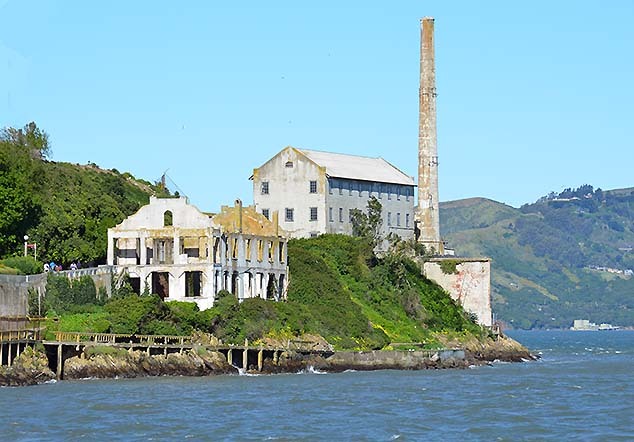 This is the one-time federal prison on Alcatraz Island in the chilly waters of California's San Francisco Bay. It housed some of America's most difficult and dangerous criminals during its years of operation from 1934 to 1963. 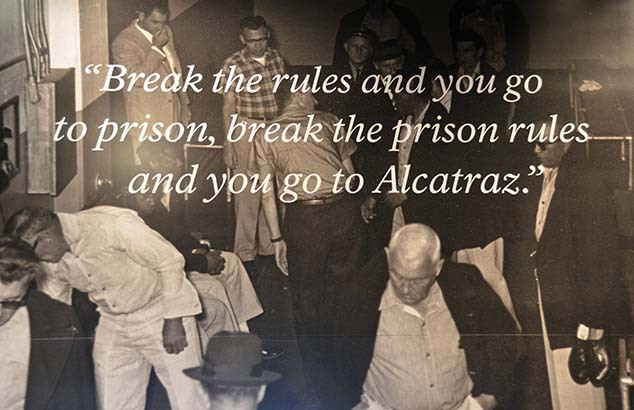 Among those who served time at the maximum-security facility were the notorious gangster Al "Scarface" Capone (1899-1947) and murderer Robert "Birdman of Alcatraz" Stroud (1890-1963). 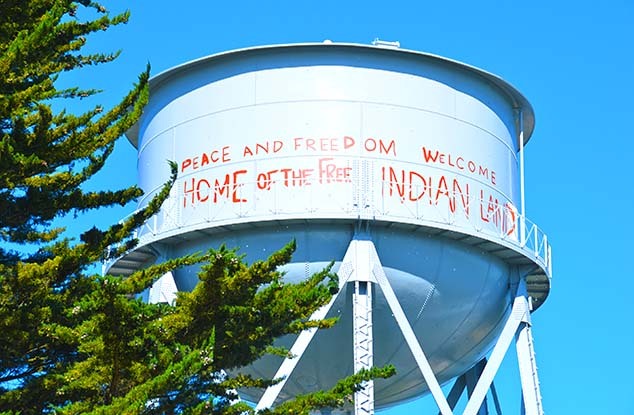 After the prison was shut down due to high operating costs, the island was occupied for almost two years, starting in 1969, by a group of Native-American activists. Today it's a popular tourist destination reachable by ferry, and a must tour if you visit the city. 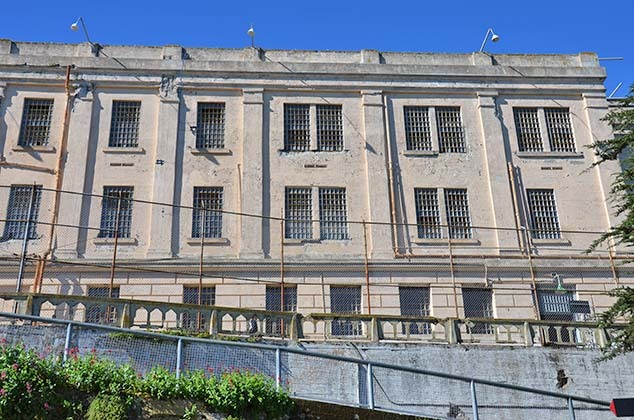 The former Alcatraz Prison was officially shut down in 1963 because its operating expenses were much higher than those of other federal facilities at the time. The prison's island location meant all food and supplies had to be shipped in, at great expense, and furthermore, the isolated island buildings were beginning to crumble due to exposure to the salty sea air. During the early 20th century, inmate labor fueled the construction of a new cell-house shown above. The 600-cell structure still stands today, along with a hospital, mess hall and other prison buildings. According to the National Park Service, when this new complex was finished in 1912 it was the world's largest reinforced concrete building. This is the C-Block corridor know as "Park Ave" by Alcatraz inmates. There were 336 cells combined in B & C Block. There were 36 segregation cells, and 6 solitary confinement cells (actually known as confinement chambers by many inmates) in D-Block. Note how small the cells were, see below. Each cell in B & C block was 5 feet by 9 feet. 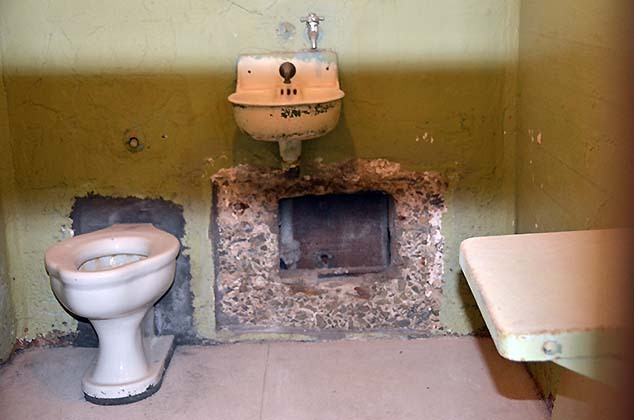 Cells at Alcatraz had a small sink with cold running water, small sleeping cot, and a toilet. 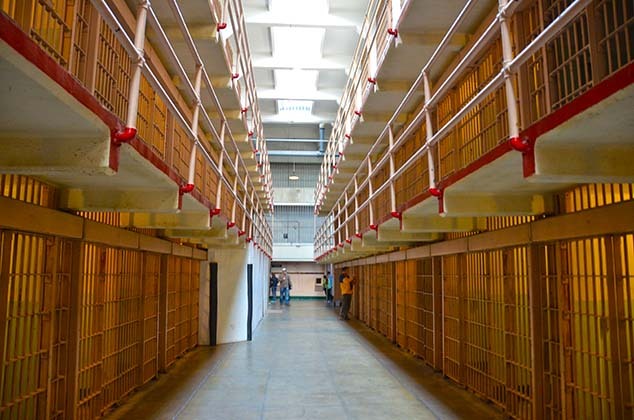 Most men could extend their arms and touch each wall within their cell. The cells in D Block (segregation) were more spacious, but still the least popular. In D-Block, inmates were confined to their cells 24-hours per days, with the exception of one visit per week to the recreation yard. Note the small hole in the back of this cell. 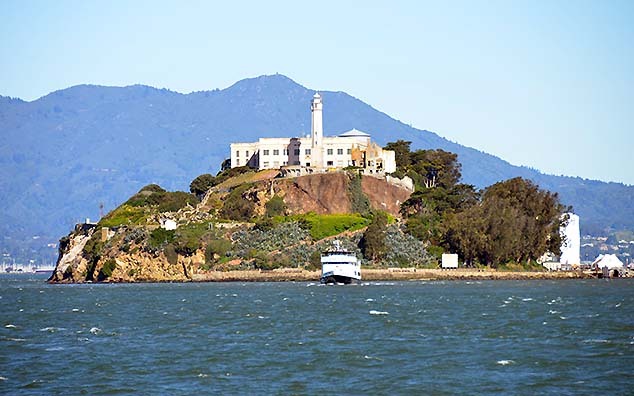 In June of 1962, a prison escape was attempted by American criminals Clarence Anglin, John Anglin and Frank Morris to leave Alcatraz Federal Penitentiary on Alcatraz Island via inflatable raft. They escaped from their cells by crawling through holes in the cell walls which they had dug with spoons over a year's time. This put them into an unused service corridor. From there they climbed a ventilation shaft to reach the roof. The trio then climbed down from the rooftop, scaled the prison's fence and assembled a raft from the prison's standard-issue raincoats and contact cement. They pumped up the raft on the northeastern coast of the island. At around 10 p.m. they climbed aboard, shoved off, and started paddling. The FBI's investigation was unable to determine whether the three men successfully escaped or died in the attempt. In 1969, a group of Native Americans led by Mohawk activist Richard Oakes (1942-72) arrived on Alcatraz Island and claimed the land on behalf of "Indians of All Tribes." The activists hoped to establish a university and a museum on the island. 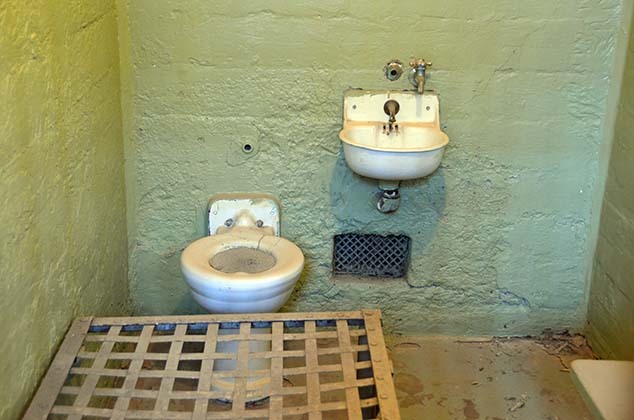 Oakes left Alcatraz following the death there of his stepdaughter in 1970, and the remaining occupiers, whose ranks had become increasingly contentious and divided, were removed by order of President Richard M. Nixon in 1971.